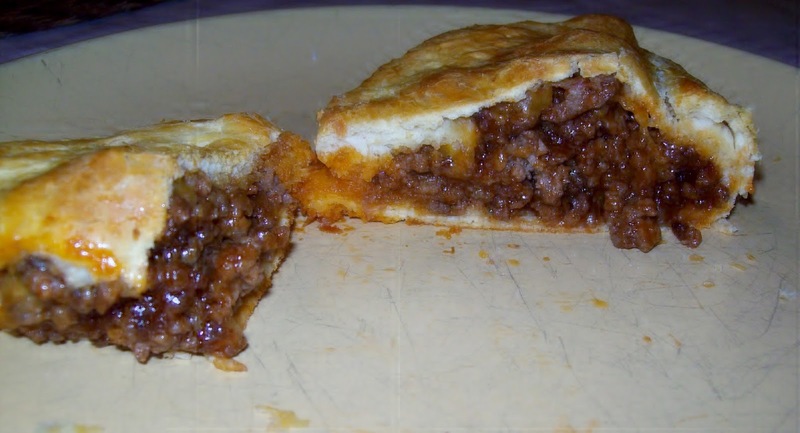 This meatpie uses a homemade version of "manwich" which is so good, especially for kids! Brown the ground beef until all the water is cooked out and only grease remains, then throw in the onions and cook until they just start to turn translucent. Cook over medium heat until moisture dissipates, stirring every 10 minutes or so, then turn to low. Stretch out biscuits to make large round 'pizza-dough' like circles (I used two biscuits per circle.) Spoon four to five tablespoons of beef mixture into them, a little to one side. Fold the other side over and seal like you would a calzone. Cook in 350 degree oven for 10 minutes, if that.